This Daily Zooniverse post was contributed by Zooniverse volunteer Jean Tate. 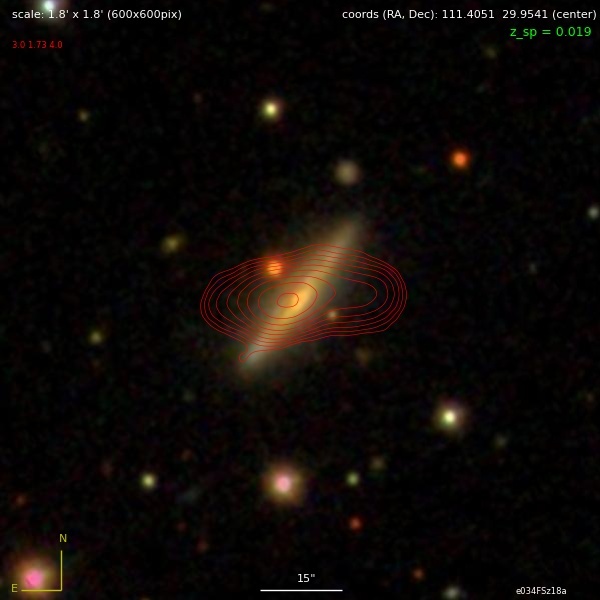 Yep, that’s an edge-on spiral galaxy with strong radio emission coming from well beyond the galaxy as seen in the visual; such objects are both rare and of great interest to astronomers, both optical and radio. They are almost certainly related to SDRAGNs, another rare beast which volunteers have been hunting, as explained in this recent GZ blog post, reporting RGZ Science Team member Minnie Mao’s poster at a conference last month. It turns out that the galaxy sisifolibre found—B2 0722+30 is its “radio” name—had been found before, but perhaps the next one you discover will be new to science? Happy hunting! Previous Previous post: Mom! You’re Messing Up my Mane!